I didn't specifically set out to see the Jardin Exotique in the principality of Monaco and, though curious, I didn't think I was that interested. So when I decided on the spur of the moment to visit the garden I didn't quite know what to expect. I thought I might like exotics; I anticipated some succulents and cacti but I never envisioned a lush garden, not with thorny plants that don't have leaves. But my morning on this April day in the south of France got off to a rocky start. 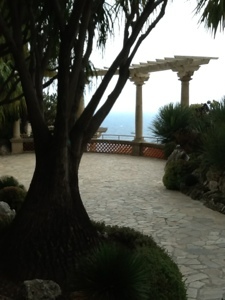 I had decided I would garden hop in Menton, France (above), which is actually quite beautiful. But after more than an hour on a city bus and a long uphill walk I arrived at a garden that was closed when it was supposed to be open. What? I walked back downhill and got a little lost (okay, completely lost). I had just wasted the whole morning without seeing any great gardens in what my travel book described as the "city of gardens." And, I was no longer confident about the prospect of my afternoon. I remembered seeing street signs to the Jardin Exotique in nearby Monaco and knew it would be an easy bus ride. Voila! Plan B emerged. Hopefully my afternoon wouldn't be lost. And within a few minutes of walking into this exotic garden, I realized this was special and I was definitely liking it. My spirits lifted. with great views of the port, the city and the coastline. The rocky garden journeys down part of the cliff and is said to have more than 10,000 plants and more than 1000 varieties of succulents, especially cactus. Rocky, yet I would say it is definitely lush at the same time. throughout the garden offer stunning vistas. I even found a beautiful black iron garden gate in an archway trimmed with bougainvillea. I do love a garden gate. Between the views of the Mediterranean coast and the garden vignettes I found myself snapping up photos like paparazzi chasing a celebrity. When I came across this one I also felt compelled to take a picture of it, I think because it was unexpected but, then again, no different from trees I am used to seeing where lovers carve their initials in the bark. While I can't say that I carved my initials on a cactus at the garden, I can say, in fact, that the Jardin Exotique de Monaco definitely has left an indelible mark on me, for good. Oh yes this truly is garden envy. I thoroughly enjoyed your day trip, well especially the afternoon. Fabulous pictures and isn't that agave stricta simply other worldly. Cripes, that is superb! I am hoping to visit Serre de la Madone soon (was that the closed garden? ), but I will now certainly be dropping by this ‘Exotique’ place too! What an amazing place! Most of the plants are very architectural. I love agaves especially! The view from the cliff is breathtaking! Thank you so much Jeannine!